It is a reflection of our benign climate that I can write a mid-summer column about the soothing role of green in the garden. Overseas visitors are often amazed when they are told that we never irrigate our garden here. Three weeks without rain is nearing a drought in our area of North Taranaki but I hasten to add that we also enjoy high sunshine hours. Much of the world is brown in summer and areas with winter drought or very low temperatures can be brown (or white) in winter, too. We are green fifty two weeks of the year. As I brought in the washing yesterday, I contemplated the view from the line which includes the modest back border of the house. 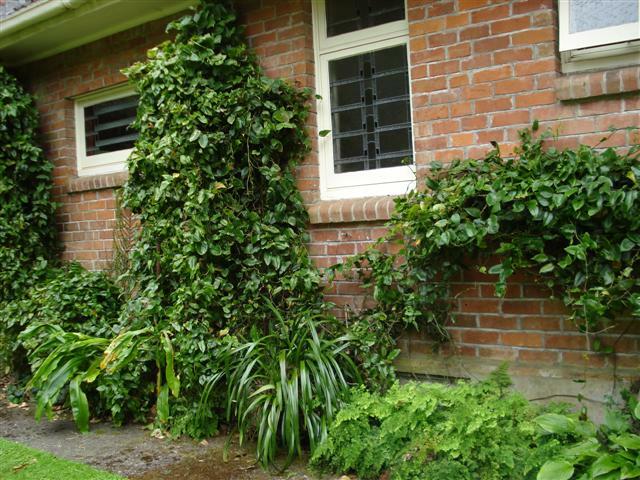 I say modest because it is the typical New Zealand house border which runs between the path and the house and so it measures about 50cm wide and several meters long. It is not always easy to know what to grow in a narrow border which is cool dry shade in summer and downright cold dry shade in winter but I did think it was looking rather lush, green and attractive yesterday. There are no flowers out at the moment so it was toned green on green and all about leaf texture and shape. The lapagerias clamber up to to reach the guttering and give height. These are commonly known as Chilean bell flowers and we have a towering pale pink one, a teetering huge white one and a red one all in a row with a daphne bush marking one end. There is good textural variation in the fine foliage of a maiden hair fern, the strappy leaves of a cymbidium orchid, a rather understated green hosta and the large, lush leaves of scadoxus, all underplanted with the mouse plant (arisarum). This last plant can be somewhat invasive but it has nowhere to invade in such a confined border and children are enchanted by the curious flowers. At other times of the year, the lapagerias flower and we have seasonal bulbs that come through but for the heat of summer, it made rather a nice restful picture of green. Restful, simple green gives a breathing space in a busy garden. Most of us achieve this with lawns where the expanse of green is a little like letting out a sigh of relief. Paved patios and decking just do not give this sense of spacious rest even if they don’t need mowing. Mind you, I was raised by a keen gardener who decided that lawns had no merit. She would rather weed and maintain additional garden than mow a lawn. Widowed early, she never got to grips with mowing. I can remember when I was about nine we moved in to a house where the lawns were rather too extensive to manage with the old push mower. She bought a motor mower. After three days and a couple of site visits from the salesman, the shop took the mower back and refunded her money. They were probably deeply relieved to be shot of her. My mother’s aura did not mix with a motor mower. It would not start for her and she decided it was jinxed. She never tried to make the acquaintance of a mower again. She simply dispensed with grass. Now I think she was wrong and it did not suit her to see the role played in garden design by the restful green space. 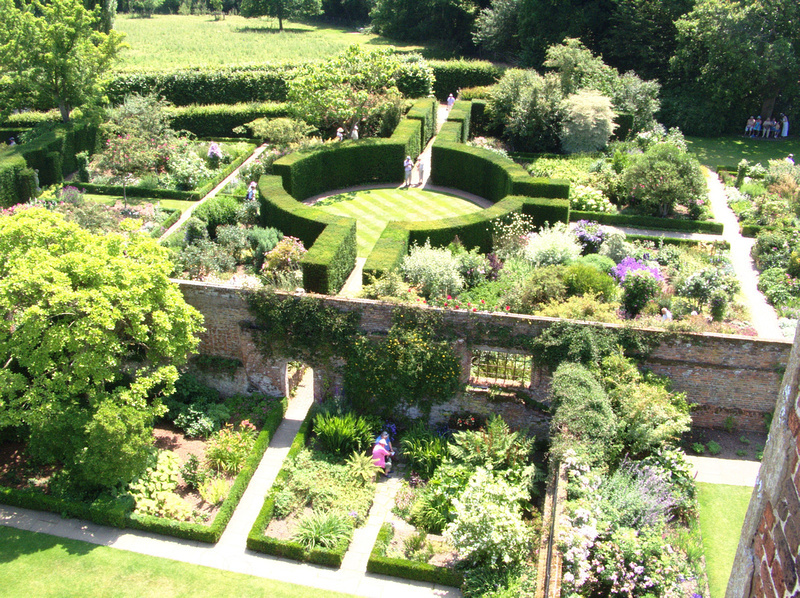 No doubt many readers have been to Sissinghurst in England. Vita Sackville West and Harold Nicholson employed a radical device in that garden to create a space – a simple circle of grass surrounded by a high clipped green hedge (probably yew). In the wrong hands, this could look overly contrived, or even naff in a suburban New Zealand quarter acre garden. But in all the busy-ness that characterises the arts and crafts garden rooms of Sissinghurst, filled with colour and texture, this simple green circle gave a place to pause. There was nothing to assault the senses. The circular lawn, viewed from above, as one can because of the splendid tower (not to be confused with a viewing platform – the tower is a relic of the former castle) is neatly and obediently striped. They may not wish to unleash a creative or careless lawn mowing person on that lawn – a spiral, bulls-eye or even an untidy mishmash would not look as perfect as the wide and precise stripes. At Hidcote Manor, Major Lawrence Johnston from a similar era and also with a busy arts and crafts garden full of small garden rooms, achieved a similar purpose with his Long Walk and his circular area – simply referred to as The Circle. The Long Walk is appropriately long, running on an axis spanning over half the garden and it is simply a generously wide mown strip of grass (no manicured lawn here – this was indubitably grass) bounded on both sides by tall hornbeam hedges. The Circle was tidy lawn bounded by clipped hedges and some rather large and splendid topiary birds. Think of it all as the gardening equivalent of the sorbet to cleanse the palate between courses at an elaborate dinner party. A sorbet would be OTT at an informal barbecue but it is entirely appropriate at a banquet. A good garden designer (the operative word is good) will understand the juxtaposition of uncluttered space and detail – that is one of their techniques. The reality is that most home gardeners in this country either can’t afford a good garden designer or they prefer not to. The DIY green space is the lawn. While technically green is a colour, in gardening practice it is perceived as colour neutral like the off white walls of the interiors of many houses. Defining the boundaries of that green space, maybe with clipped hedging, gives it more oomph as long as it is immaculately maintained. However, the imposed formality of the perfect circle needs to be managed carefully – you really need your proportions and context right. There is a fine line between circles with panache and being contrived, or worse – pretentious. The sweep of lawn is safer. It was a revelation to us to see how effective the deliberate green breathing space was in both Sissinghurst and Hidcote. But most gardens will benefit from the framing that a green lawn provides and in the heat of summer, it makes even more sense. This entry was posted in Abbie's column and tagged Abbie Jury, Abbie's column, garden design, Hidcote, lawns, Sissinghurst, summer gardens on 12 February 2010 by Abbie Jury.